A prefatory apology: some of the material in here is in previous posts (e.g., here), and all of this material will be very familiar and therefore unexciting to many political scientist readers. But elsewhere, people don’t get it, and so attention must be paid. 1) Independents are the largest partisan group. 2) Independents are actually independent. 3) Change in the opinions of independents is always consequential. MYTH #1: Independents are the largest partisan group. 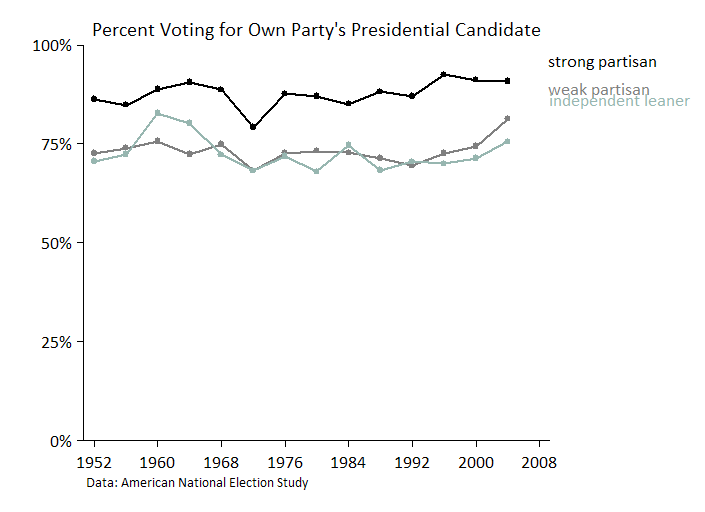 But here is the problem: Most independents are closet partisans. This has been well-known in political science since at least 1992, with the publication of The Myth of the Independent Voter (here). The number of pure independents is actually quite small—perhaps 10% or so of the population. And this number has been decreasing, not increasing, since the mid-1970s. MYTH #2: Independents are independents. There is very little difference between independent leaners and weak partisans. Approximately 75% of independent leaners are loyal partisans. Again, there is really no difference between partisans of either stripe and independent leaners. As far as their views of Obama are concerned, it doesn’t really matter whether you say you’re a Democrat or an independent who leans Democrats, and the same is true on the other side of the aisle. Only “pure” independent appear to have evenly divided attitudes as of November, but, as above, these people are only a very small part of the sample—7% overall. MYTH #3: Change in the opinions of independents is always consequential. 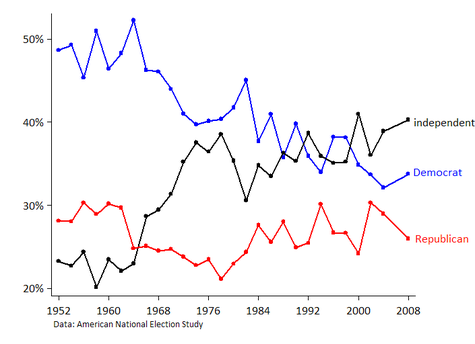 Much ink has been spilled in the last month or so about how Obama is “losing” independents. 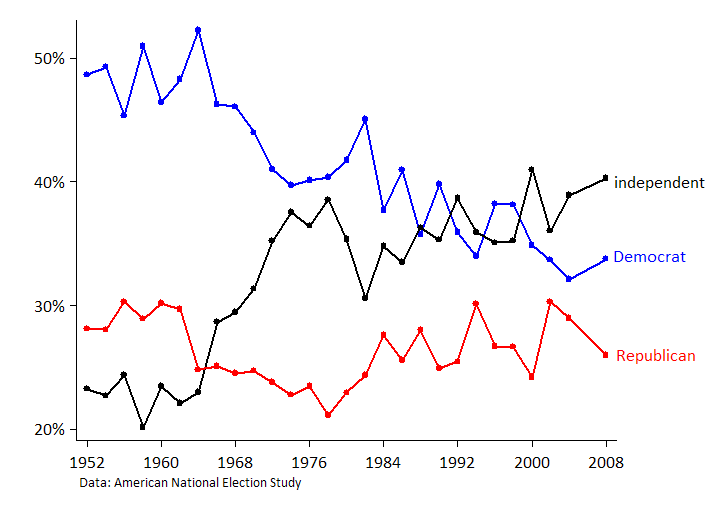 This is sometimes based on mindless comparisons between the behavior of “independent” voters in the 2008 presidential election and their behavior in the 2009 gubernatorial elections—ignoring, of course, that these are different groups of voters (thanks to variations in turnout) being asked to make a choice between different candidates. But even better comparisons can be misleading. 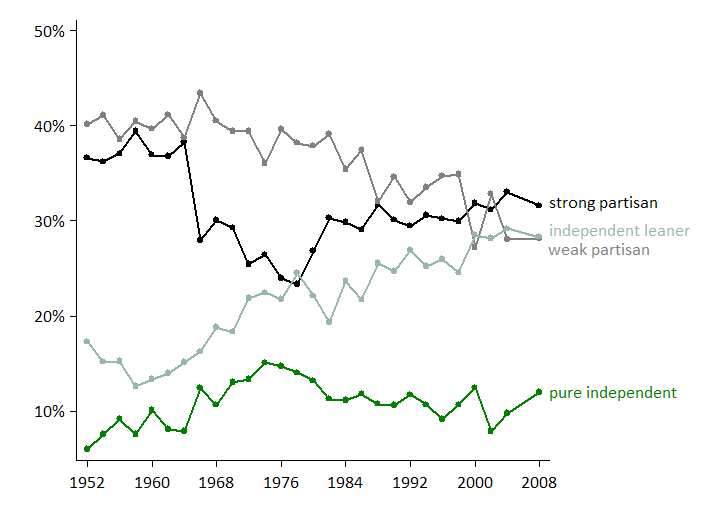 Second, movement among “pure” independents is generally less consequential simply because there are so few of these people and because they are less likely than partisans to vote (only 44% of pure independents reported voting in 2008 vs. 82% of strong partisans). If an election was a nailbiter, then the votes of pure independents could provide the margin of victory, but I don’t know of any estimates of how often that is actually true. With those points in mind, let’s return to the decline in Obama’s approval that is evident in the graph above. The question is: how much of his overall decline is due to declines in each of the partisan groups. Is it really independents who are driving the trend? Which adds up to 15.5 points—close enough for back-of-the-envelope. So, even though the drop among pure independents is the largest (25 points in the graph above), the small number of pure independents mutes their impact. 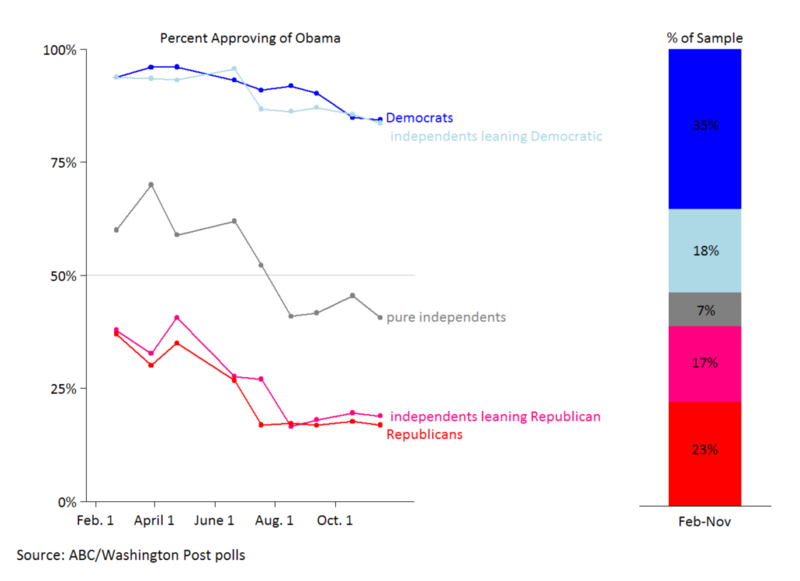 Obama’s approval has gone down mostly because of trends among partisans. Combined, Republicans and independents leaning Republican account for 50% of the drop (8 points out of 16). The two groups of Democrats account for 34%,. Pure independents account for the rest. Thus, Obama’s declining approval rating is more a story about losing the Republicans who are unlikely to vote for him anyway than it is a story about losing independents. And one further take-away: 90% of the public is partisan and about 80-90% of those voters vote for their party’s candidate. This is why the story of presidential elections is so often a story about partisans and not the fence-sitters who CNN recruits for debate dial groups. I should offer a concluding apology for this long post. But I hope it goes some distance in correcting common misperceptions about the size, behavior, and importance of political independents. fn1. I thank Jon Cohen of the Washington Post for sharing these data. The day the media narrative changes to admit that independents aren’t as important one would think is the day we’ll know political science really can change the world. Without Independents, there is no horserace. CNN & friends want the illusion of a horserace. I identify as an indie, but can’t imagine ever voting for a Republican until they shed their racist, homophobic, and xenophobic tendencies. I expect that won’t happen in my lifetime. Well, I tried to use my TypeKey identity, but it failed. Please check out my blogged response to your article. I am an independent. If anybody at MonkeyCage is counting: I’d vote for more articles like this one. Thanks for posting it.